Join us for the Spring gathering of the Cookbook Club on Thursday, May 2, 2019 at 7:00PM. Sometimes-food-writer Kelli Samson and Browsers Bookshop owner Andrea Griffith will host an evening of good food and conversation. This is a potluck-style event with every attendee choosing a recipe from the cookbook to share with the group. The event is limited to 16 participants and the purchase of the cookbook at Browsers confirms your place on the list. After the event is full, we will form a waitlist. If you have questions, please email Andrea. 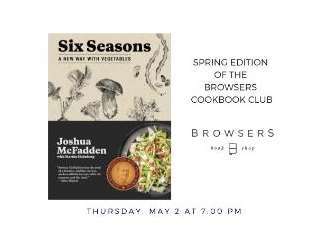 This season we will be cooking out of Portland chef Joshua McFadden's cookbook, Six Seasons: A New Way with Vegetables. Copies are available at Browsers now.